Shedding light onto what it's like to work at a high growth startup. People often wonder what it is like to work at a startup as opposed to working in a much larger, already established company. There are these grand ideas that life in startups is filled with days of ping pong, doing work when you feel like it, huge brainstorming sessions, and running around trying to get all sorts of things done with no real plan. To be very honest, only some of that is true and life in a startup differs from company to company, but here is what life is like at the startup that I get to be a part of everyday; Desk Nibbles. When I joined Desk Nibbles, they had reached a stage where their idea had gained validation (i.e. it had real potential to create money/jobs) and are currently in the later part of the stage referred to as “traction” (i.e. realizing this potential). The stage a startup is in can be semi-indicative of what goes on on a daily basis. Because we were in the traction stage, this meant one thing for me: bring in new business. My day was largely centred around this objective of bringing in new business, and while there are many ways to do this, cold calling works best for us. Because of this, my day was structured around what we call “peak calling hours” so that we could reach as many people as possible. Between the hours of 9:00 am – 11:30 am and later at 1:00 pm – 3:30 pm, I was either finding or talking to prospective clients over the phone or by email. This list of tasks are the general things that the majority of my attention was given to, but the work that I did definitely did not stop there. Working in a startup means you need to be able to fill many different roles than the one you’re given. We were encouraged to create something that would have a positive impact on the business on our spare time. These side projects were an important aspect of working at Desk Nibbles that allowed us to wear many different hats in this company. This was great – especially as a coop student – because it allowed you to fill more than one role and grow your skill set beyond just sales, marketing, design, etc.Some of the projects I got to take on were a free trial marketing campaign, case study writing, and developing strategic plans to improve our customer’s experience with our service. All these projects allowed me to see different sides of the business on top of developing skills in a variety of areas. Working in a startup is truly a dynamic experience and you need to be adaptive and flexible. A problem can arise which demands your complete attention and a proper solution right away. Whether it’s an unhappy customer, a supply chain issue, or a website or marketing flaw, these tasks need to be taken care of immediately. One of the reasons Desk Nibbles, and startups in general, are great is because of the small team. Communication is as easy as turning around and telling Emil, our CTO and co-founder, that there’s a small fix to be made on the website, or sitting beside Eric, Head of Sales and co-founder, and getting his feedback on an email I’m about to send to a client. This is one thing that allows startups with large potential to be so dynamic, responsive, and scale into much larger companies. With a team like Desk Nibbles, work isn’t the only thing we do. 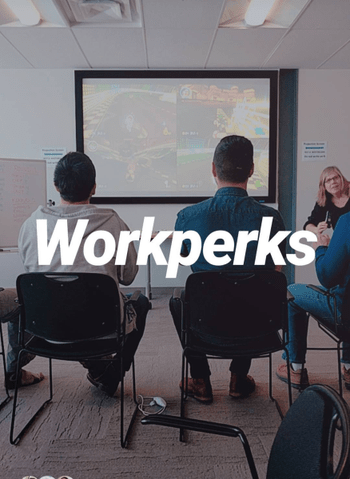 One of the most noticeable differences I see from working here as opposed to larger organizations is the workplace culture. With the type of business that we do – bringing happiness and productivity to offices – you can imagine that we have a great environment here. 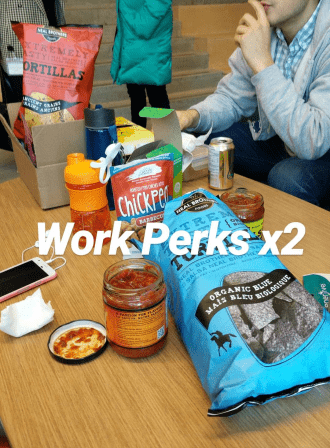 It goes without saying that we have the best snacks in the building, but we also have various rituals that make Desk Nibbles a unique place to work. From banging our desktop gong every time we make a sale to the “no lunch at desk” rule, these rituals keep us happy, healthy, and motivated. Our team also loves to be competitive. 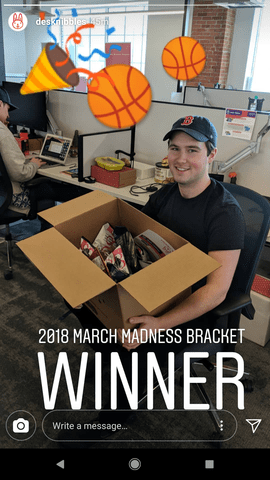 Creating our March Madness Brackets gave the office a good level of energy and something to look forwards to and bond over outside of our work. Fyi, I won. I hope this post has given you a good insight into what life is like in a startup from the work that you do to the environment you’re working in. While every startup is unique and has their own culture, there are some key aspects that differentiate them from larger organizations. My time spent at Desk Nibbles has been great because I have been challenged and given responsibility, grown professionally, and had the opportunity to make great connections.